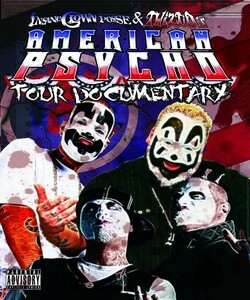 This awesome DVD is your true to life, behind the scenes look at the backstage happenings of a nationwide ICP and Twiztid tour! Nothing is off limits! Witness the real life personalities of the “World’s Most Hated Band” and the “Demented Duo”. Get to know the entire backstage cast behind the controlled chaos of a Juggalo concert. Join Twiztid on their hilarious pre-show adventures to pawn shops and smoke stops and witness J and Shaggy as they tackle various press stops in New York City. Meet unique and insightful Juggalos from all over the country. This in-depth documentary even captures on film Twiztid’s highly publicized arrest in Florida! Nothing is off limits in this authentic and revealing look at life on the road for the Hatchet Family!